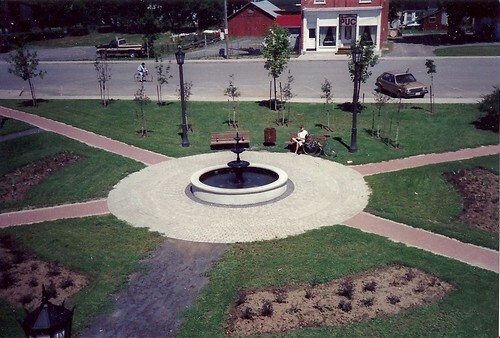 Photographs of Deseronto, Ontario dating from the 1970s to 2011, depicting a variety of Town events. They include a set of aerial photographs of the town from the 1980s; the interior of the former Home Hardware store in the Baker Block on Main Street; the O’Connor House on Main Street before its demolition; the 1989 100th Anniversary celebrations, photographs of Centennial Park and Rathbun Memorial Park; the opening of the Deseronto Public Library in its 358 Main Street location in 2001; the Ontario Provincial Police handover ceremony in 2001; an Easter Parade from the early 2000s; a Santa Parade; the 2002 New Year’s Levee; and the 2010 Olympic Flame run in Deseronto. Most of the photographs appear to have been taken by Town staff. One envelope was donated to the Town by Irene Usher and contains photographs taken by her late husband, Tom. The photographs were found in the Town Hall and donated by Dana Valentyne, Economic Development Officer, in April 2015.